When I first started working (more than a few moons ago), my very first corporate job was in finance. I remember being so confused by all the financial terms. De minimus. APY. ETF. APR. I remember when we were creating all of our web pages while at Amex. We built a glossary for all the terms and acronyms for consumers to use. DB vs DC. 401(k) vs 403(b). A glossary! Then I went to health care. HSA. HRA. Deductible. Premium. Co-insurance. I’ll never forget arriving at Cigna in 2005 and being handed a 200+page acronym dictionary. No wonder people were confused! I learned early on that people really, truly thought that the health care industry purposefully tried to confuse them by using such complex language. And the more research I did, the more it seemed evident that that may be the case. It became very, very obvious to me that language mattered. From my first day at Definity Health back in 2001, I’ve worked to make it simpler for people to use and understand healthcare. I created and launched the award-winning “Words We Use” program at Cigna in 2005. Our learnings since then have led us to develop the “Let’s Be Clear” program. And we have helped many companies to launch it within their walls! I’ll tell you — there is still work to be done. But what I’ve learned can be applied to just about any communication — whether it be customer, board member, or employee. And it can be applied to any industry. Here are a few of our tips. More is almost never better. Ensure that your communication is clean, clear and to the point. 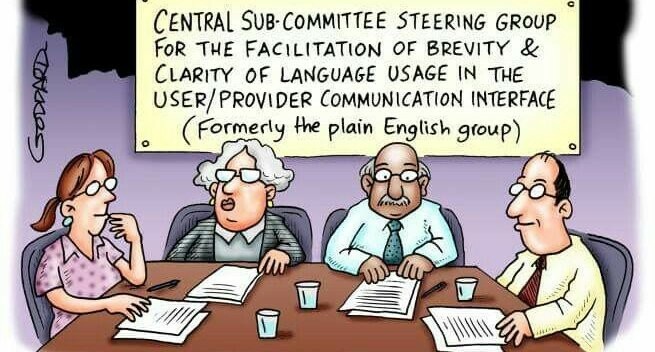 That means fewer words, more bullets, and really, really concise information. Focus on one topic at a time – if you can. I know, I know, I know. Everyone wants to be able to pile on information into the piece you’re sending out. But let’s be honest. We know what is really valuable and we know what isn’t. Stand up and ensure that your communication brings value to your reader. Ensure that your communication has a call to action. Make it very clear exactly why you’re sending it and what your recipient is supposed to do. If you are just sending out an FYI, rethink it. People don’t generally need FYIs — they need to know what they have to do to respond. Find that call to action. Strive for a 5th or 6th grade reading level. This doesn’t mean your audience is stupid. It means that your job is to take your complex product or service offering and make it super, super easy to understand. And it means that we all skim. We are inundated with information, and I promise you, people spend their time reading and understanding the things that are really important to them. Everything else gets skimmed. Make it easy for your audience to know where to go if they have questions. Include phone numbers, email addresses, websites. But make sure you have multiple ways for someone to find out more/do the thing they need to do/ask a question. Trust me — ensuring that it is easy for your audience to do the thing that you’re asking them to do will only raise you in their esteem. We have a ton more tips over here at Chief Customer, and we love working with companies on simplifying communications, building their communications strategies, and a whole lot more. We’ve had incredible success installing our “Let’s Be Clear” communication strategy at numerous companies — and we’d love to help you!